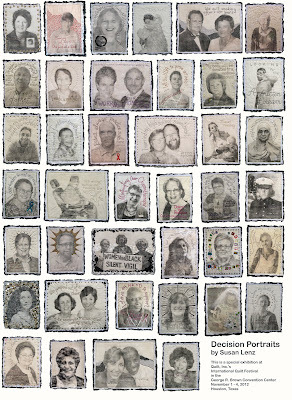 Art In Stitches: A week since my last post ... Decision Portraits going to HOUSTON! Your secret project sounds very exciting and it would be wonderful to see your quilt on display at Houston. You are getting the recognition you deserve. Enjoy! Congratulations! The quilt show in Houston is a Big Deal, a lot of fun, and an experience like no other. Don't worry about not knowing anyone; quilters are über-friendly and you will find people to hang out with. I have work in some special exhibits and am considering making the trip- perhaps I'll see you there! How exciting! You will be overwhelmed by the fabulous quilts! It might just broaden your world! This is so awesome and will be a big turning point for you , I am sure!!!! Will have to start making a list of the wonderful folks you will meet and those that you should connect with at the show!!! I so wish that i could see all of these incredible pieces together. the Muslim piece that was part of the Fredericksburg show had a big impact on many people!! bravo to Steve for all of his help and support of you!! Thank you for including my sister. She deserves it! And congratulations on showing in Houston! Oh goodness!! You will be blown away by Houston! Such a monumental show & vendor experience. I look forward to seeing your work in person. Congratulations on all that is percolating for you. yikes - 60,000 people!? Some of them are my local guildies up here in Canada! ; ) Congratulations Susan! That's so very exciting!! Hi! There's a "book" but not a "published" one. I looked into self publishing. It is possible but it is also expensive for 107 portraits! It would also require hours upon hours of dedicated work learning how to operate the on-line software that makes self publishing possible. My husband and I are discussing the idea of totally revamping my Decision Portrait blog ... with the "pages" I've created for the "book" that I have ... which is just a series of individual pages including each portrait's photo and my "story" about each one. It has been printed three times at FedEx Office and spiral bound ... each one costing about $110. I want the information, the healing process, all the stories, and the entire adventure to be accessible and revamping the blog just might be the best, cheapest, and easier way. Obviously, I know how to blog already! Susan, this is such a huge deal!!! 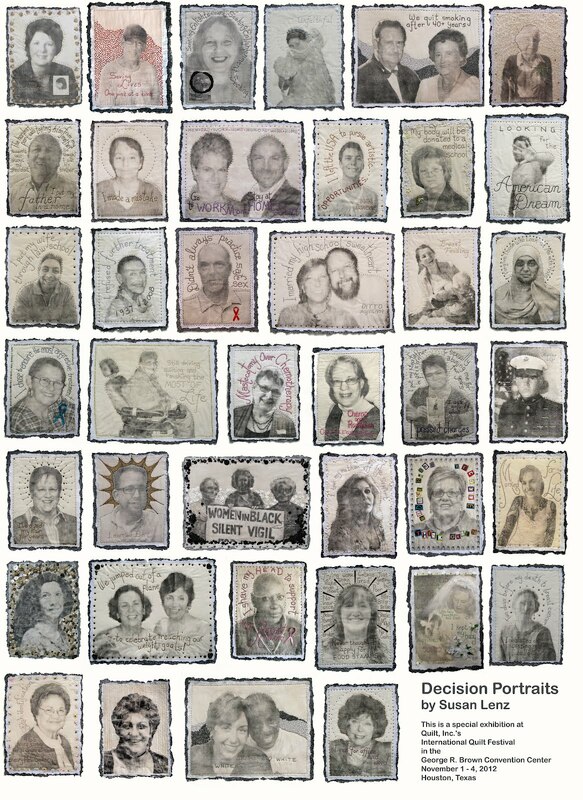 Houston Quilt Show is my dream and I am so happy you are going and have your portraits in the show. I am honored to be one of the portraits that will be hanging. I expect to hear from a few friends that attend the show. I am interested in knowing the prices framed and unframedbplus shipping. Congratulations! There is no stopping you now. OK, I am getting the idea that the Houston Quilt Show is a big deal. A REALLY big deal. And I also am SO happy that Decisions has been selected to be a part of it. I have always loved Decisions. I have said before that I think the whole world needs to look at these. A book is definitely an interesting idea. When I win the lottery, I'll be the first to help finance this. But in the mean time, I can't imagine how difficult it must have been to select which ones go to TX. I know that ALL are very close to your heart. Wow. And I'm going too. I am so honored. I am also honored to be going with such great people because, through your portraits, I feel I sort of know them. No, I don't sort of know..I DO know, in my heart. Susan, this is really something. Words like Awesome and Great just don't cut it probably but I'll say them anyway!